CheckMeUp might seem like a very useful program for those computer users who are interested in the speed of their internet connection. It is because the program will allow them to check it in just one click. If you visit the official website of CheckMeUp (checkmeup.co), you will notice that it claims to be an easy-to-use desktop application which will allow you to test your broadband quality and save results. Unfortunately, it is not exactly true. As the researchers of pcthreat.com have revealed, CheckMeUp will not act very beneficially because it is classified as an advertising-supported application. If you wonder what this means, you should know that CheckMeUp will flood your screen with various commercial advertisements. According to our researchers, they might affect all the browsers, including Internet Explorer, Google Chrome, and Mozilla Firefox; thus, it would be clever to erase CheckMeUp entirely and start using a more reliable application instead of it. 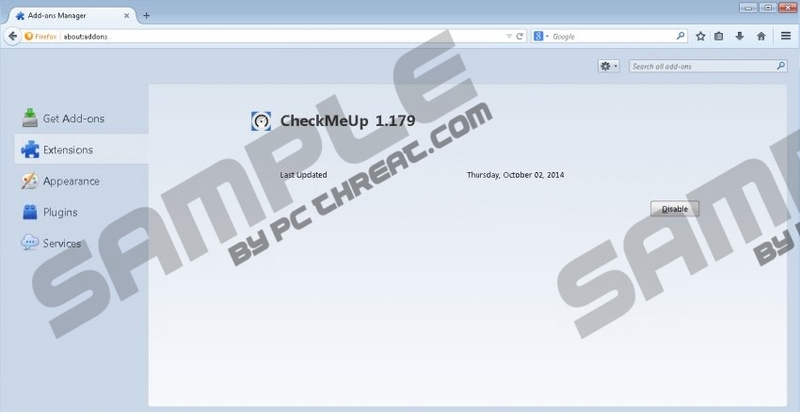 The specialists of pcthreat.com have found out that CheckMeUp has replaced a previously published program called SpeedChecker. They both act in the same manner; thus, it is better to avoid them. If you have already detected CheckMeUp or SpeedChecker on your system, you should hurry to eliminate them because they will show annoying commercials. They will not allow you to surf the internet freely and might route you to the websites that contain malicious software. Keep in mind that the website might seem decent at first sight; however, it might still contain malware. Therefore, we recommend that you ignore commercials completely. It does not seem that you will be able to download CheckMeUp from its official website; thus, it is very likely that it travels bundled with different kinds of applications. According to the research carried out by our security experts, CheckMeUp might come in a bundle with Reg Clean Pro, RocketTab, VuuPC, YTDownloader, ZoomifyApp, and similar applications. Therefore, it is worth checking whether your system does not contain them as well. Unfortunately, it might be rather difficult to do that yourself, which is why we recommend using an automatic scanner. CheckMeUp can be easily removed via Control Panel; however, if you do not feel competent enough to do that yourself, you should know that you can acquire an antimalware tool and perform a full system scan. The only important thing is to choose a trustworthy scanner. We recommend using SpyHunter because it is capable of erasing all kinds of infections. Select the software that you wish to remove and click Uninstall. Open Uninstall a program and right-click on CheckMeUp. Quick & tested solution for CheckMeUp removal.